Shirts With Random Triangles: New Ghostbusters Reboot Trailer Unleashed Upon The Internet. New Ghostbusters Reboot Trailer Unleashed Upon The Internet. 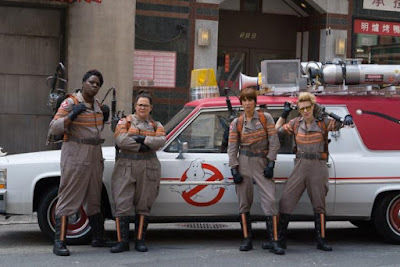 Ghostbusters 2016 cast. Image via slashfilm.com. Like it or not, the all-female Ghostbusters reboot is a real thing headed to theaters this July. The trailer was released on Thursday, and it does show some promise. Here's the trailer. Hey, everybody else is posting it so why can't we? The new Ghostbusters stars Kristen Wiig, Melissa McCarthy, Kate McKinnon, Chris Hemsworth, Leslie Jones, Elizabeth Perkins, and Andy Garcia. Original Ghostbusters cast members Bill Murray, Dan Aykroyd, Ernie Hudson, Sigourney Weaver, and Annie Potts make appearances in the film as well. The new Ghostbusters is directed by Paul Feig, best known for Spy, Bridesmaids, and the Other Space webseries. It opens on July 15.